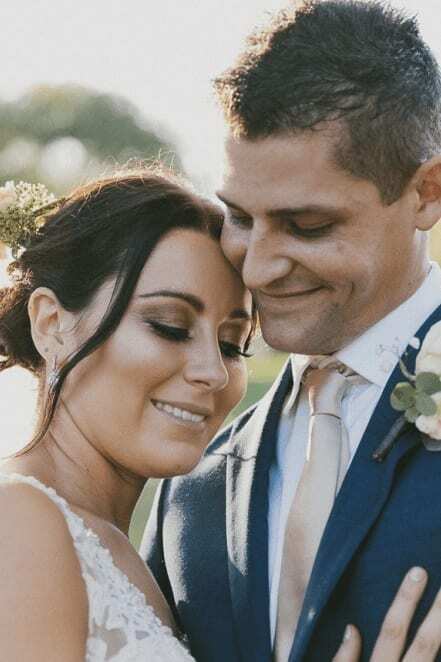 Caitlin & James’ special day at Victoria Park was the perfect wedding in every way! It’s obvious to see they’re madly in love with each other! Caitlin wore the stunning HARPER by Mori Lee & MGNY – a bold an beautiful gown with so much personality. This gorgeous dress features a flounced organza ruffle skirt and flattering v-neck lace bodice. The beaded lace appliqués flow into a low back. The satin waist belt is the perfect finishing touch. Caitlin adorned her bridesmaids in glittering rose gold/bronze dresses, which were bloused at the waist. The stunning floral artistry by Rosita Flowers featured lovely pops of peach, which tied into the warm colour scheme beautifully. Despite the threat of rain, Caitlin and James enjoyed their rain-free day with friends and family and couldn’t stop smiling! Congratulations to Caitlin and James on their stunning day, we wish them all the happiness in the world. Take a peak at their stunning wedding photos down below!